Mushroom kernel popcorn. Have you heard about it before? I hadn't before I tried Mogoo Popcorn. What's the big deal? It's round, it's fluffy, it's easy to munch until you're wanting to get another bucket at 9pm, an hour before they close. 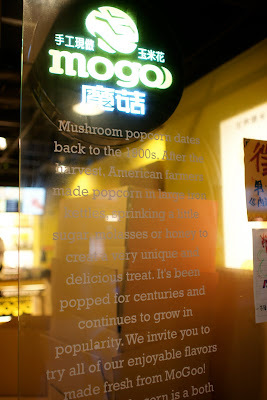 Mogoo Popcorn uses only mushroom kernels, so therefore its name in Chinese- Mogoo, the Chinese word for mushroom. The first time I spotted the shop was seeing the bright yellow sign after eating dinner at Pho Hoa across the street. 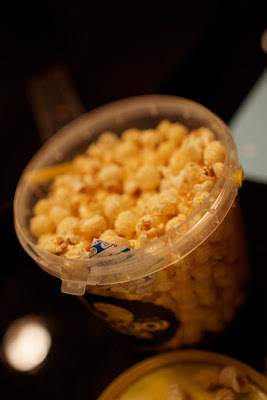 The first time I tried Mogoo Popcorn in the store I wasn't that impressed. Perhaps it was the stale samples. Maybe the other flavors- seaweed, cheddar cheese, chocolate- were not my thing. But I'm sure glad my friend Cynthia gave me a bucket as a gift so that I could become a fan. Their "American Original" flavor was pretty much kettle corn, it was light, crunchy, sweet, but not too sweet, with almost intangible taste of sea salt. The shape of the popped mushroom kernel gives it a round shape that gets pretty evenly coated and satisfying texture when you eat it. The original flavor is my favorite, but if you want something sweeter, you can try their "American Caramel," "Hazelnut Caramel" or "Okinawan Brown Sugar". If you want something different, you can get the "Black Forest Chocolate" or Seaweed. For the "American Original" flavor, Mogoo offers three different sizes- small is a long bag (NT$90), medium is (NT$150) and large comes in a extra large long bag (NT$200), and the bucket is NT$110. The other flavors have slightly different prices. I like getting it in medium because the bucket keeps the popcorn from getting stale and is just the right size for not eating way too much. The smell of freshly made kettle corn was permeating the store and there was no way I wasn't getting a bucket. Off to the right side of the store, you can spot the popcorn makers doing their magic. None of that premade movie theater popcorn here. I would totally sneak in some of this in rather than buy the often stale sweet popcorn at the theater. Boxes also crowded the store making it almost hard to walk around. I guess it had become a popular option for gift giving, as my friend had also given us all a bucket at a lunch date a few months ago. But if you find yourself addicted to the mushroom shaped popcorn, don't blame me! Just take back your bucket for refills like my friends do to get a NT$20 discount. Ooh, mushroom flavored popcorn, now that's something I'd definitely try. Kid friendliness: some flavors might be too dense for kids, but what kid doesn't love pie? Taipei is a city full of desserts- you can easily find cake-by-the-slice in every coffee shop or bakery; fruit topped shaved ice or scoops of ice cream for the summer days; colorful macarons and delicate napoleons, and now even frozen yogurt. Pie seems to be an elusive Bigfoot in the world of Taipei desserts. Look long enough, and you'll find it offered on the menu of a few American places like Jake's Country Cafe, ACC, or the Diner, or your best bet for pumpkin pie around Thanksgiving time- Costco, or randomly in the basement of Sogo at a little shop called Rose Pie. 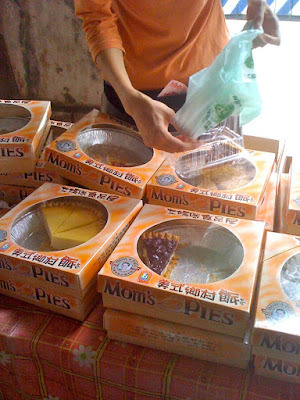 When I was craving a slice of lemon meringue pie a few years ago, I started searching for pie places in Taipei, and started hearing about Mom's Pies. It sounded so mysterious. It was sold off a truck? Would it taste American style homemade like its name promised? Most importantly, was it good? So when I was having lunch with a friend at Happy Korean and spotted a woman at the table next to us with a bag that said Mom's Pies, I quizzed her about where she got it. She said it was just right around the corner of the restaurant, on the sidewalk across the street from AIT, and kindly gave me her flier. So my friend and I paid the bill, hurried outside and sure enough, a woman with a table full of pies was on the street corner. We'd found Bigfoot! I'd heard about it for so long, it was weird to finally see it in person. 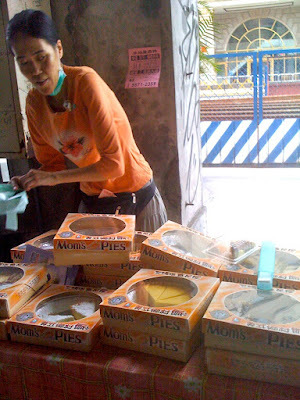 Although some people would think twice about buying a pie from the street, this made sense to me since Taipei is a city where you could buy practically anything from a street vendor, before LA was the city where you could buy almost anything off a truck. But instead of a truck, Mom's Pies has been driving a van and selling it around different spots in town from Tuesday to Friday- the updated weekly schedule can be found on their website, though it is only in Chinese. You can also call for free delivery if you order more than 2 pies. I spotted lots of flavors- pumpkin, chocolate, peach, cream cheese, cherry cream cheese, blueberry cream cheese, and chocolate cream cheese, and I know they have some more interesting flavors like red bean, taro, green tea cheesecake, purple yam and oatmeal (?!?!). 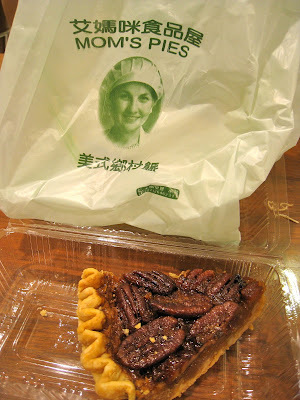 The slice of pecan pie(NT$45) was full of large pecans and had a good sweet, sticky filling and the crust was flaky. A whole pie of the same flavor is NT$300 with 8 slices. I've had their cheesecakes after finding them this day- coincidentally, someone gave a relative of mine a pie of different slices (NT$360) and their cheesecakes are dense and a bit heavy. They are so thick that you could pick up the whole thing by the slice and it would be a solid piece. The red bean and green bean flavors also kind of weirded me out (not really American homestyle), but I want to try the peach and apple in the future. Where have you spotted Mom's Pies and did you give it a try? What's your favorite flavor? Dozo- I had heard the name quite a few times, but didn't know much about the menu. Even noticed its grand entrance and glowing red sign when driving by on Guang Fu South Road- it's a few blocks away from SYS Memorial Hall or United Hotel. But I never got a chance to eat there until my friends chose it for late birthday dinner after a screening of New Moon. One of my good friends is a true Twi-hard fan and watching it with her definitely made it more fun. More Hollywood hotspot than homestyle, Dozo is the perfect sort of trendy place for those birthday dinner and drinks celebrations. On, the first floor, the elevated walkway is more of a runway, but they had reserved a room upstairs in the VIP tatami rooms where you can see if you are louder than the room next to you or the taiko drummers that come out to perform (I think after 10pm). And like any good izakaya, the Chinese and English picture filled menu offers up many drinks and dishes to choose from, from grilled skewers to deep fried and stir fried dishes, from modern sushi rolls and appetizers to traditional sashimi, from beer bongs to hot sake. 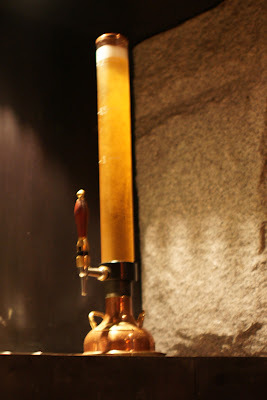 Yup, I said beer bong. In addition to the Japanese fare, there's a bit of creative fusion going on- Italian-style fried udon or korean style rice in stone bowl- or a new spin on the familiar, like spicy tuna. Two of my favorite dishes at Dozo were tuna appetizers, especially since I love spicy tuna and it's hard to find it done well here, though I've been slowly finding it at more places. The Seven Spice Flavored Tuna Pate (NT$180) is served in a chilled ceramic dish and you mix the seven spices with the tuna, and scoop it onto the fresh romaine lettuce. The other was the Tuna and Avocado Salad topped with Shrimp Roe which was also a mix and scoop thing, but this time on toasted bread slices. The texture of the cruncy toast and popping shrimp eggs is a good contrast to the soft tuna and avocado - a spicy tuna bruschetta if you will. If I came back, I wouldn't order the Grilled Beef Sushi, (NT$220) which was a bit dry. Instead get the Boneless Beef Spare Ribs which was a plate of bite sized slices of juicy beef. Or for something different, you can try the Charcoal grilled beef with garlic sauce which was like beef sashimi, as it is pretty much raw. I think the first time I had raw beef, I can't remember where, I just went for it- I didn't even want to think about what I was eating. And it does taste sort of like sashimi, but with the texture of... raw beef. Haha. Something for someone who like their prime rib and steaks rare. I also found myself going back for more of the Gigantic Grilled Rice Ball- it was basically as the name sounds. If you are like me and like the browned bits of crisped rice at the bottom of a stone bimbimbap bowl, then you'll love this since the entire ball is all crispy rice underneath the bonito. And the soft Deep fried homemade tofu with peanut which had a distinctive, nutty flavor that was almost dessert like. the Grilled squid with seven spice powder. I don't think I would have remembered these dishes if it wasn't for the pictures. and the Assorted skewers with chicken, intestines and beef. By the time the Spicy Korean rice cakes came, I was too full to really taste more than a bite, but it was very spicy! As you can see, we had a lot of food and this was only the tip of the extensive menu. If you want to try more things, then it's a great excuse to round up your friends for dinner, try a bite of each dish and reorder what you like. The food came at a good speed for our hungry group, and we added new rounds of orders a few times. Open until 3AM, Dozo is the perfect place to grab a late night bite. Anyone else been to Dozo? What's your favorite dish there? PREFACE: I'm bit annoyed that they weren't selling crepes during the afternoon on 12/31 so that I could buy a few crepes to take some more pictures for this post and nosh on before the New Year's Eve madness- but they were essentially waiting for the night crowds. Why bother even being open and having two people standing around if you aren't selling to paying customers? Anyways- isolated event. So here are the pics I have. End rant. Happy New Year! END PREFACE. Perfect place for picking up a post-movie snack or catching up with someone in 101's shadow, Suzette is place for those who want a real crepe. 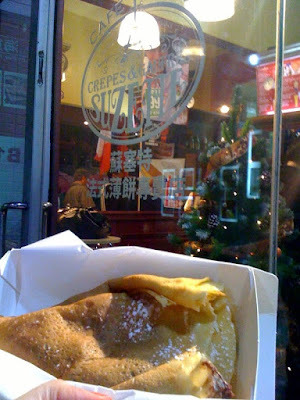 If you're like me, then you were in shock at the taste of your first "Taiwan crepe" which was crispy, papery dry and not at all like the velvety crepes back home in the states. So when I saw the signage for Suzette opening(I thought the name was Crepes Suzette, but I think it's just Suzette), I was beyond excited. Occupying a small outside corner of NYNY (just right around McDonald's), they have quite a few umbrella covered tables for customers to lounge. The location is so perfect for people watching near 101, that they even had VIP reservations available for New Year's Eve for the midnight fireworks. 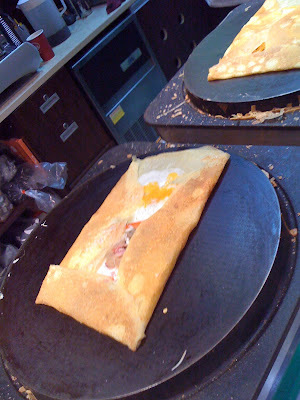 Crepes are made to order on one of their two crepe hot plates, and there are over 20 kinds available- both sweet (Crepes sucrees and roulees) and savory (Crepes Salees and bechamel) available on their English/Chinese menu. Butter, butter & sugar, nutella, nutella & bananas, apple & cinnamon- all the standards. It's fun to watch them at work while you are waiting for your order. I noticed that the savory crepe I wanted to order didn't have cheese and when I requested to have some added, they agreed without questions. I was happy that the crepes were a fraction of the price of my former crepe favorite, Mamm Goz, which unfortunately closed down. I was a bit surprised to see the final result to be rolled up like a burrito, but I am not sure if that's only when it's to-go. 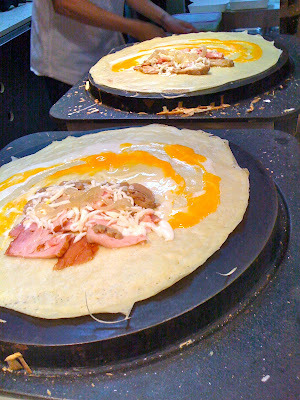 The Mushroom, Pork and Egg crepe (NT$150) was good, but nutella crepes were worth coming back for again and again. When I walked by Suzette after a Christmas day screening of Sherlock Holmes, jonesing for a nutella and banana crepe, I was surprised to see it so crowded at 10pm. After all, every visit I had for a few months over the summer, I was barely their only customer. 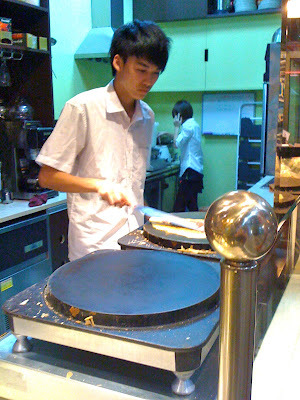 Tonight it was a 20-30 minute wait after ordering and they were out of Apple Cinnamon crepes (NT$130). I didn't know if it was the holiday crowds in the area, the cold weather, the word of mouth had finally spread, the revamped counter menu with more pictures or the non-Chinese owner/crepe maker making the crepes- or maybe a combination of all the above. Then again, that night was some of the longest lines I'd seen at Burger King, Coldstones and Starbucks. 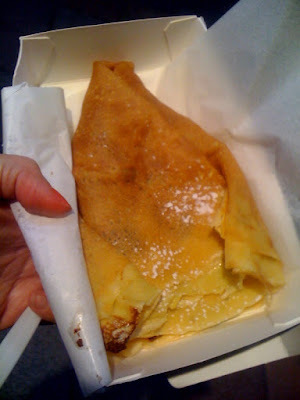 My banana nutella crepe (NT$80) was warm, gooey and soft- a perfect late night bite while walking home amongst the Christmas lights and cool winter night.